Samsung's Galaxy S6 edge+ and the Apple iPhone 6s Plus are two of the hottest 'phablets' available today, and though both smartphones are worthy options for discerning gadget geeks, each has distinct strengths and weaknesses. Here are six ways the GS6 edge+ beats the iPhone 6s Plus. If you're a "phablet" user, plan to be one in the future or you're just interested in the latest and greatest gadgets, you're likely aware of both the new Samsung Galaxy S6 (GS6) edge+ and Apple iPhone 6s Plus. The two grande smartphones are perhaps the most popular, high-end phablets on the market today. But despite the shared letter "s," numeral "6" and "plus" in their names, they have little else in common. I've been using the GS6 edge+ for more than two months, and I purchased my iPhone 6s Plus two weeks ago, on iPhone launch day. After some side-by-side use, I found a number of clear strengths and weakness for each smartphone. The following sections detail the features, functionality and other options I miss most when I switch to the iPhone 6s Plus from my GS6 edge+. This post is not a review and it is not designed to suggest the GS6 edge+ is a "better" smartphone than Apple's new flagship phablet. I also found a number of ways the iPhone 6s Plus outshines the GS6 edge+, and you can find details in my companion post, "6 Things iPhone 6s Plus does that Galaxy S6 edge+ can't." The most unique thing about the GS6 edge+ (and its more diminutive brother, the original GS6 edge,) is its "Edge screen," or curved display, which lets you interact with the device and trigger certain functions using the sides of the screen. For example, "Edge lighting" options make the curve of the display light up custom colors when the phone is placed face down and your receive notifications from your most frequent contacts, or "Edge People." (You can add up to five contacts.) The "People edge" displays similarly color-coded tabs along the curved side that show you when you have notifications from those specific people. The "Apps edge" gives you quick access to the five apps you use most often — or whichever apps you want to show up. When the phone is asleep, you can quickly slide a finger up and down the curved edge to see a variety of information without fully waking it, including the date and time; battery status; news updates; and alerts from your applications. And the GS6 edge+ "Night clock" feature displays date, time and battery information on the curved edge when the phone is asleep, during a designated time period. The iPhone 6s Plus really doesn't offer anything quite like the GS6 edge+'s Edge screen features — and neither does any other phone on the market, for that matter. 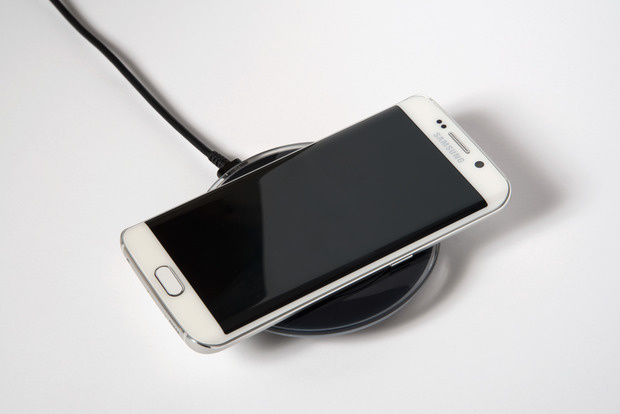 The GS6 edge+ supports today's two major wireless charging standards: the Wireless Power Consortium's (WPC) "Qi" (say: chee) standard, and the Power Matters Alliance (PMA) standard. The iPhone 6s Plus doesn't support wireless charging at all, at least not without some sort of adapter. That means you can use any Qi- or PMA-compatible charging accessory to power up your GS6 edge Plus, while you're stuck using Apple's Lightning cords (or Lightning cords from third parties) when charging the iPhone 6s Plus. If you're not used to wireless charging, you won't miss it. However, once you purchase a few charging pads, and place them in your office, by your bedside, or on an end table in your living room, the thought of constantly plugging and unplugging a cord just seems … antiquated. And as more and more retailers, restaurants, hotels, airports, automobile makers and others start to support wireless, power cords will only become more loathsome. Both the GS6 edge+ and iPhone 6s Plus support a number of mobile wallets and mobile payment services, namely Samsung Pay on the GS6 edge+ and Apple Pay on the iPhone. Third-party offerings, including Google Wallet and LevelUp, also exist to let you pay on the go. However, Samsung Pay gives the GS6 edge+ a distinct advantage over other mobile payment services and additional smartphones. Samsung's service uses magnetic secure transmission (MST) technology, in addition to near field communications (NFC), for wireless payments, while Apple Pay relies solely on NFC. Unlike NFC, which requires a specific type of modern PoS terminal, MST "is accepted at nearly all payment terminals with a card reader," according to Samsung, though some terminals will require software updates. I've used Samsung Pay without any issues at a few random retailers that definitely didn't support Apple Pay — though I get receive some skeptical stares when I explained how it worked to clerks who were unaware. The payment experience isn't quite as seamless as Apple Pay (you have to actually wake the device up to use Samsung Pay instead of just tapping it against a terminal), and one of my banks still doesn't support Samsung's service. 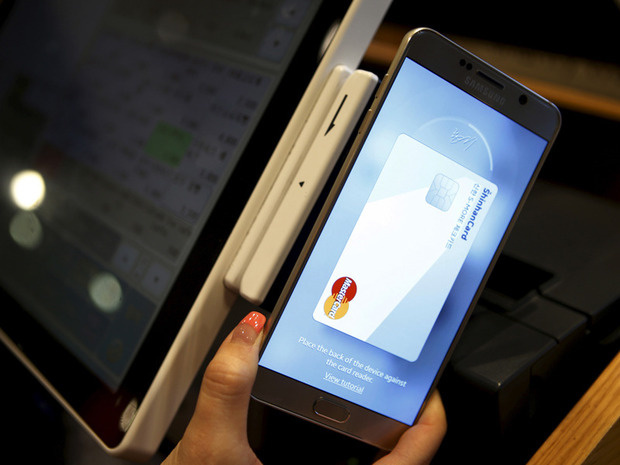 But overall, MST support makes Samsung Pay a more viable, and reliable, mobile payment option.